But over and over it says, ‘Trust God’. He’s already got it all figured out. God does not share His glory with anyone which is why He does not allow us to know all things, only He knows all things. If we are to know God’s mind, we need to walk in the spirit of the lord. The spirit f God searches the deep things of God, and He lets our spirit in on the details. When we do something awesome for someone according to His will, or if we are used to give a word or impart healing, even save a soul- we have to be very careful to not expect anything in return from those people and to not pat ourselves on the back as if there was anything we did that was so great. Remember God is a jealous God and He does not share His glory with anyone. God constantly reminds me that He tells us in advance about almost everything, either in our hearts, dreams or visions, or in his word. He likes to give us a word of encouragement in advance, so we can stand believing on that word. Usually, that same word is the word He expects for us to use against the winds of the world and Satan. Another thing God always brings to my attention is my instinct. I am constantly sucking my teeth because I resisted in trusting my instinct. God confirms His own word, usually giving us more explanation or even clarifying the instinct he has built in us. We have a built in reflex, which subconsciously operates giving us information about our environment. 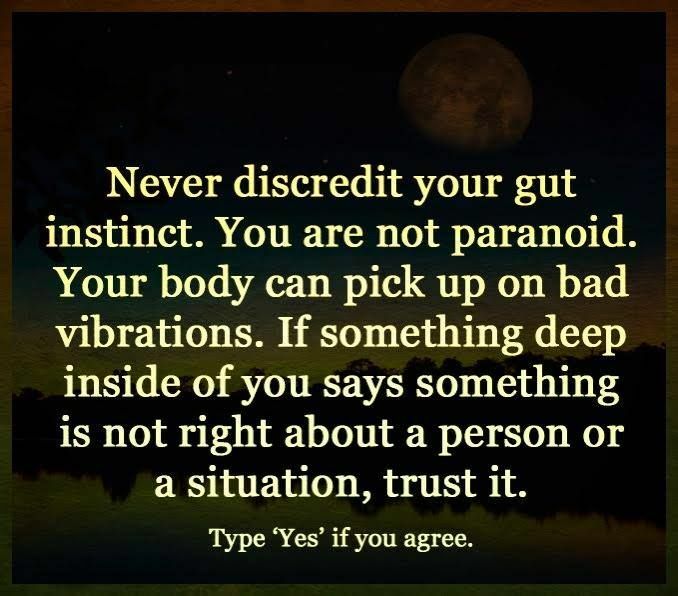 This instinct or intuition, is not the same as Holy Spirit. But God did create us with a sense of knowing, which is intuition. We intuitively know what is good and bad, we all have a conscience. Even if we were cavemen, with no moral law or social justice, we would know instinctively that killing, stealing and taking another person’s spouse is wrong. For example, the way new born turtles crawl to the water after hatching from eggs. They do this by instinct. An inborn pattern of behavior, which is a response to specific environmental stimuli. An innate capability or aptitude for tact and diplomacy. This is not the same as Holy Spirit, God’s spirit is in our spirit and our intuition is the soul (emotion, heart and intellect). And usually God will confirm what our intuition was trying to tell us. When the bible says, ‘by his Spirit’ God searches all things, and teaches the souls of men, it speaks of the work the trinity does. There is revelation that only comes from God the father, as in Matthew 16:17, when Peter declared “You are the Son of God”. Other knowledge that is revealed from Jesus Christ, like Paul’s calling in spreading the gospel to the gentiles. And of course, the Holy Spirit, the teacher and comforter, who is the spirit of wisdom and revelation Himself. God gave us intuition, so that we may learn to center ourselves, not to depend on ourselves. Intuition usually starts off the sentence, but Holy Spirit will finish it. God will send us help when we wholeheartedly ask Him for help, and are willing to accept it. Lord Jesus, thank you for making us tri-part beings. It’s pretty cool that we are similar to you in that aspect. Today I pray for our bodies, our souls and our spirits separately may you heal, restore and prosper each part that makes us who we are. You are father, Son and Holy Spirit; and without my soul, I could not be me, without my body, I couldn’t even be here, and without my spirit I could never receive from you. I thank you for our instincts, and I pray you help us to grow stronger in following our instincts and knowing when to seek you for details and direction. In Jesus name, Amen.